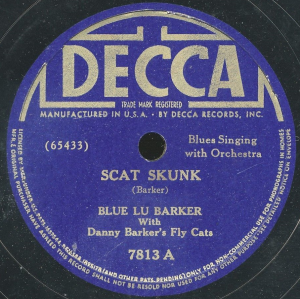 In its 7000 "Race" series, that ran from 1934 to 1942, Decca released enough records to do over a hundred of my shows, and the great Rhythm & Blues on this series is widely rereleased and easy to find. I do these shows every now and then, and maybe the Legends of the Rocking Dutchman show will last long enough to get to a hundred Decca shows - but I won't be playing them every week. The shows where I do spell out a small portion of the catalog of the leading label in African American pre-war music, though, are pretty much an easy break for me. The fun thing is, that it provides you with wonderful and seldomly heard Rhythm & Blues. And every time I include bluesmen and women who recorded hundreds of sides for the label. Today, I have Peetie Wheatstraw, Johnnie Temple, Rosetta Howard, Frankie 'Half Pint' Jaxon, Georgia White and Bill Gaither who performed under the name of Leroy's Buddy in honor of his friend Leroy Carr who died in 1935.